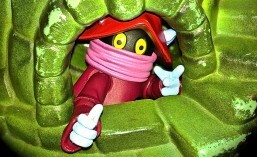 Groovy Dork List….MOTUC, Magic, Coffee, Pathfinder, Arkham, and MineCraft. Groovy…I was able to find a massive local source of Masters of the Universe items! A dude at the Barnyard Flea-market sells them. Workable on the price (I AM a cheapskate, remember! ), and also a knowledgeable and enthusiastic fan. I will be reviewing the three items I picked up today soon! Groovy…I am Back-in-Black! I am playing Mono-black devotion as my current for Magic: the Gathering strategy! Just keep putting black permanents out, get that devotion ramped up, and then slam the opponent with a Grey Merchant of Asphodel. And unless they cancel the Merchant, there is little they can do. The fine folk at the Tangled Web were ready to trade the other day. I scored a few more Nightveil Spectors, which I really, really needed, and a Desecration Demon as well! Readers of this blog will know that my color is black. I have recently been playing other colors, but it seems the old dark evil ways are returning! Dork…Don’t get me wrong…I had a blast, but I would play someone, anyone really, for almost 45 minutes. And then somehow lose…I would disrupt their strategies over and over, only to be trumped eventually. You can only run Four gray merchants! Groovy…In the same vein…The Born of the Gods set looks amazing! I can’t wait to see what else they reveal. I have preordered a box, and me and my two boys are going to play in the sealed deck pre-release. I already see cards with promise for the Fencing Ace deck, and for the black devotion deck. The inspired mechanic sounds interesting, and Mogis, God of the Slaughter is going to be crazy! Dork…They haven’t released a new challenge deck 😦 The Hydra has been a blast! Groovy…The Keurig Vue system is wonderful! This machine makes not only coffee, but cafe drinks and iced tea! Most everything I have tried tastes great! Dork…(semi-dork, I guess)…Those Vue cups cost a bunch. BUT, I am subscribed to the Cafe Express Savings Club, that basically means I only pay half for the Vue cups. Groovy…I am now a Dungeon Master…I mean Game Master. Me and the SpartanSmurfs, and even the SpartanWife have been playing Pathfinder. This is our first taste of this kind of gaming. I don’t know what I think about it yet. I like being the game master. But I don’t always feel like it. These games tend to run over an hour. Also, the SpartanSmurfs are too easily killed off. I have to be careful not to off them unintentionally. This has already happened three times. The first time I considered it a real death, to try and send them a message. I didn’t like it, though. So I have been inserting lucky saves into the game. Dork…I have a pretty good imagination, and can flesh out the Pathfinder world pretty good for the boys. But they on the other hand tend to just want to battle constantly, rather than take in their world. Groovy…I have been playing Batman: Arkham Asylum again. That game is terrific! I especially like taking out the armed thugs! That is a lot of fun. Dork…I don’t get MineCraft. I played it. I just don’t get it. Posted in Arkham, Born of the Gods, cheapskate, Coffee, Dungeons and Dragons, Face the Hydra, Friday Night Magic, Game Master, Groovy Dork List, Magic, Magic the Gathering, MineCraft, MOTUC, Pathfinder, SpartanNerd, THEROS.